Wedding is July 3, 2019. 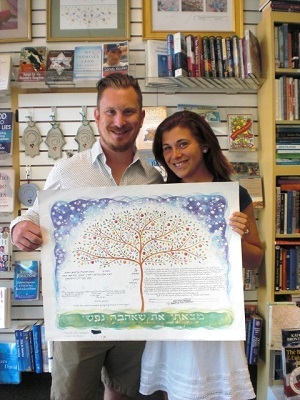 Brooke and Corey chose Nava Shoham's Tree of Life. Wedding is July 20, 2019. 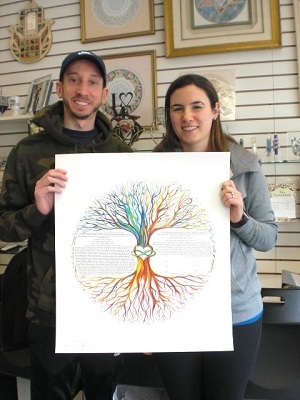 Brooke and Corey chose Nava Shoham's Tree of Life. Wedding is July 13, 2019. 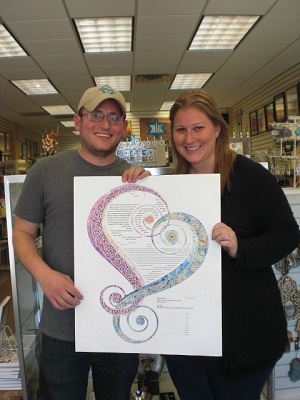 Kim and Scott chose Amy Fagin's One Heart. Wedding is July 3, 2019. 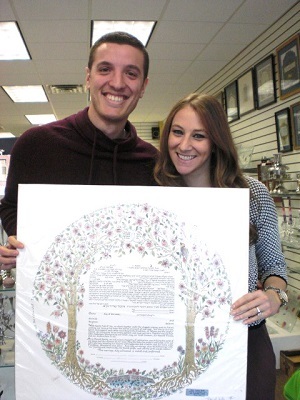 Jennifer and Michael chose Mickie Caspi's Arbor. Wedding is June 15, 2019. 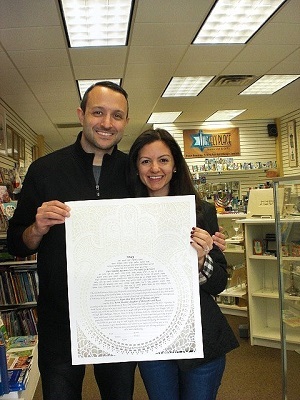 Shanna and Harry chose Cindy Michael's Devotion 2 Papercut with "flannel" color backing. Wedding is September 14, 2019. 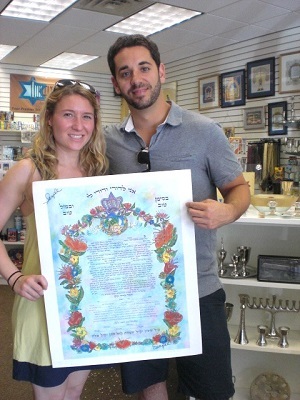 Julie and Evan chose Danny Azoulay's Aviv (Spring). Wedding is June 23, 2019. 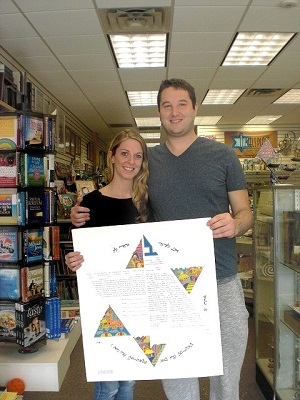 Samantha and Brock chose Nava Shoham's Two Hearts Beat As One. Wedding is March 16, 2019. 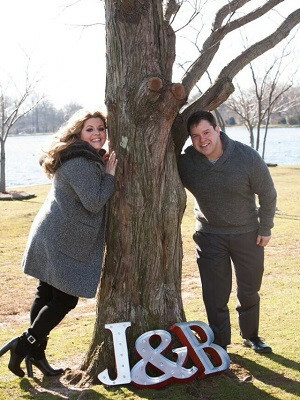 Lindsey and Jared chose Mickie Caspi's Joy and Happiness. Wedding is November 11, 2018. 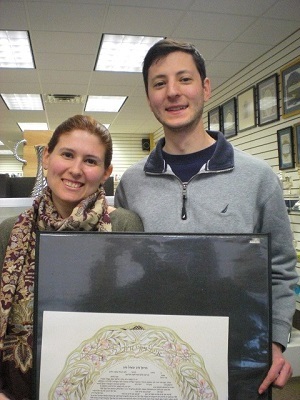 Melanie and Ben chose Mickie Caspi's Arabesque Giclee in Brass. Wedding is October 28, 2018. 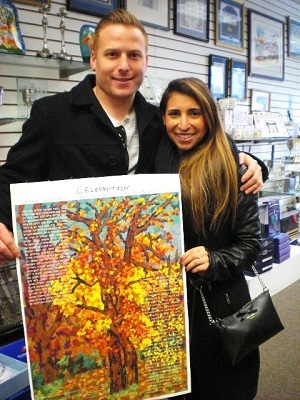 Valentina & Andrew chose Mickie Caspi's Seasons of Joy. Wedding is October 27, 2018. 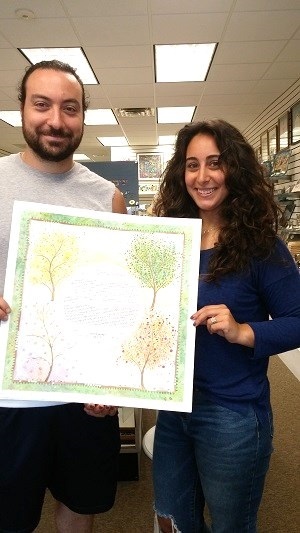 Dara & Max chose Mickie Caspi's Seasons. Wedding is October 21, 2018. 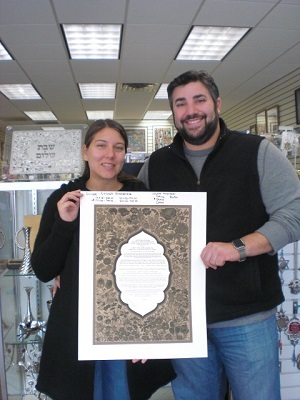 Stacy and Adam chose Mickie Caspi's Persian Silk. Wedding is July 29, 2018. 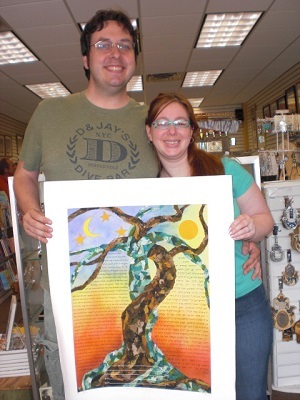 Alyssa and Michael chose Betsy Teutsch's Tree of Life 3 with silver accents. Wedding is July 3, 2018. 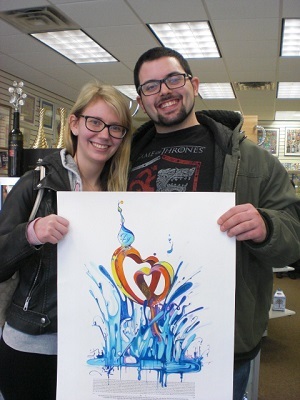 Sam and Jordan chose Cindy Michael's Devotion 2. Wedding is October 20, 2018. 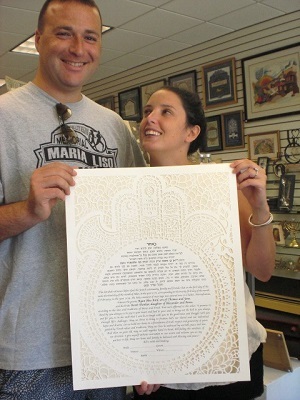 Erica and Dan chose Danny Azoulay's Venetian Lace. Wedding is September 2, 2018. 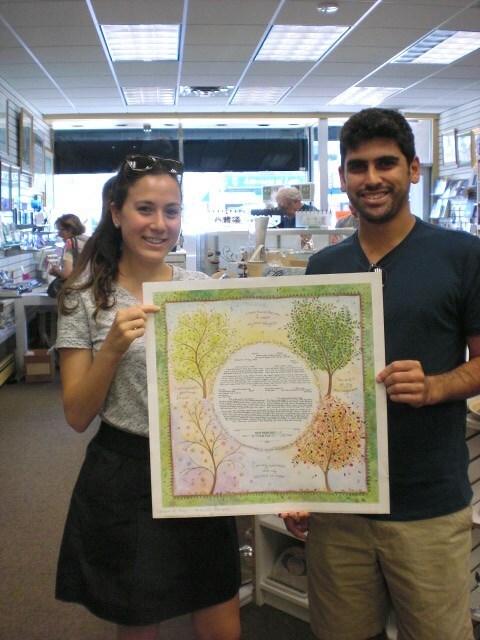 Samantha and Matthew chose Betsy Teutsch's Tree of Life 3 with gold foil. Wedding is March 23, 2018. 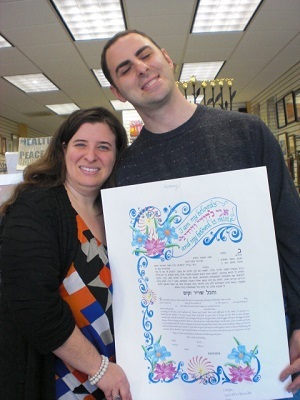 Jessica and Alex chose Nishima Kaplan's Celebration. Wedding is December 31, 2017. 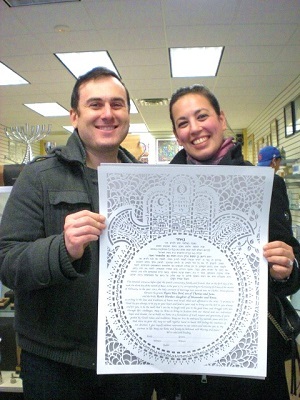 Elana and Michael chose Cindy Michael's Devotion 2. Wedding is October 17, 2018. 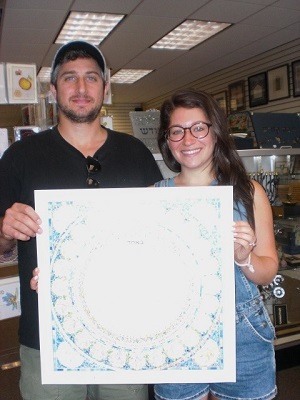 Alison and Matthew chose Danny Azoulay's Blue Sky. Wedding is February 17, 2018. 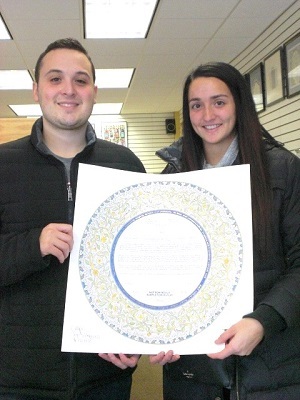 Aubree and David chose Mickie Caspi's Seaons of Joy. Wedding is November 18, 2017. 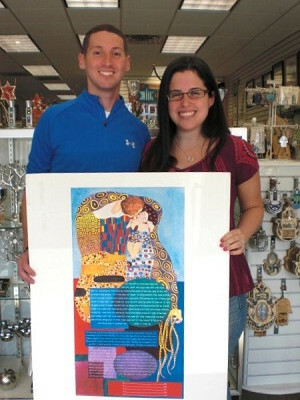 Karla and Andrew chose Mickie Caspi's Blue Silhouette. Wedding: December 16, 2017. 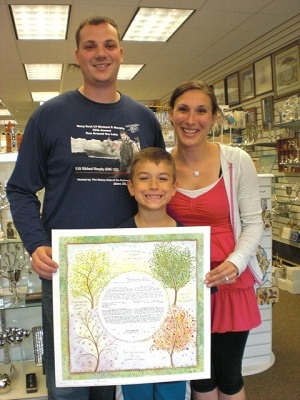 Wendy and Adam chose Betsy Teutsch's Tree of Life 3. Wedding: November 12, 2017. Jacklynn and Timothy chose Amy Fagin's Adagio. Wedding: September 9, 2017. 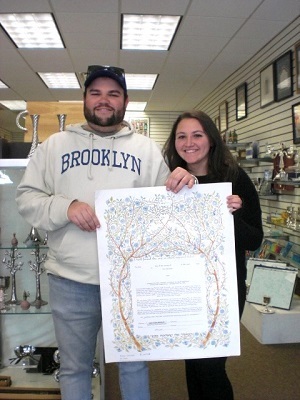 Lindsay and Trae chose Cindy Michael's Devotion 2. Wedding: October 29, 2017. 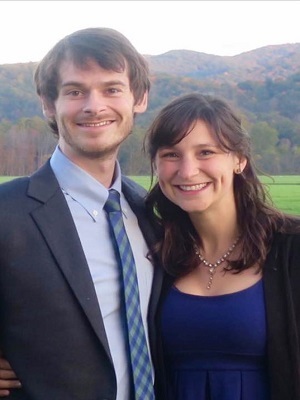 Fallon and Scott chose Karla Gudeon's Bird Song. Wedding: June 3, 2017. 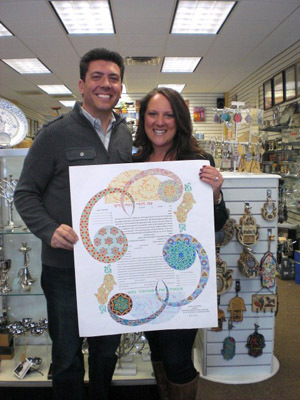 Catherine and David chose Cindy Michael's Devotion 2. Wedding: September 3, 2017. 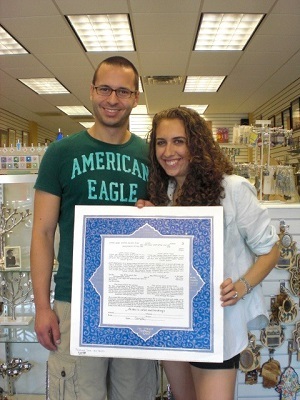 Jaclyn and Daniel chose Cindy Michael's Devotion 2. Wedding: September 3, 2017. 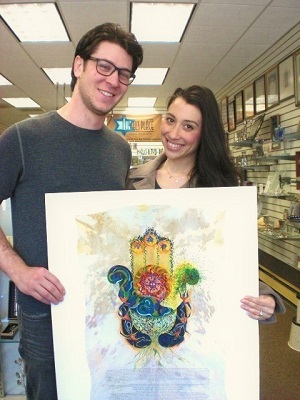 Malorie and Jason chose Ruth Rudin's Chai Star 5. 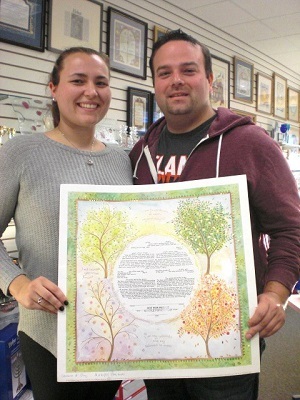 Wedding: September 3, 2017.Rachel and David chose Nava Shoham's Two Hearts Beat As One. Wedding: May 28, 2017. 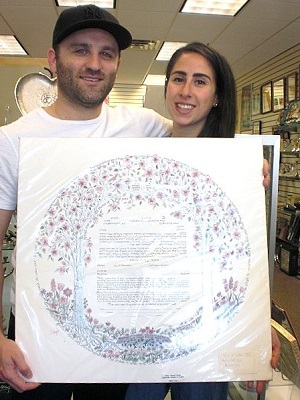 Sara and Scott chose Ruth Rudin's Life Cycle. Wedding: May 21, 2017. 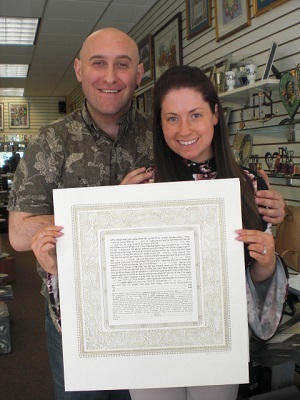 Lauren and Richard chose Cindy Michael's Harmony. Wedding: February 20, 2017. 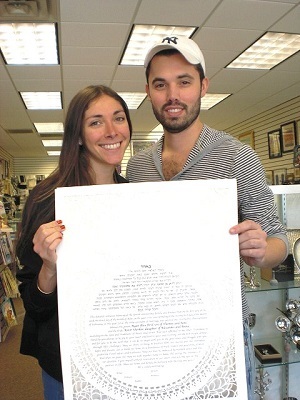 Amy and Lucasz chose Cindy Michael's Devotion 2 ketubah. Wedding: November 23, 2016. 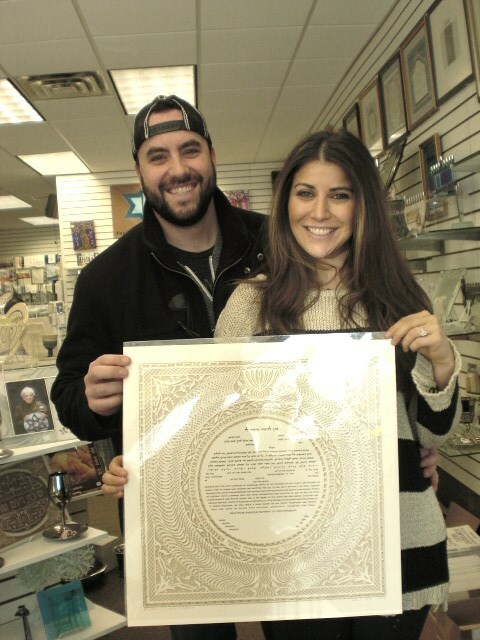 Jacqueline and Brian chose Nava Shoham's Ahava. Wedding: October 22, 2016. 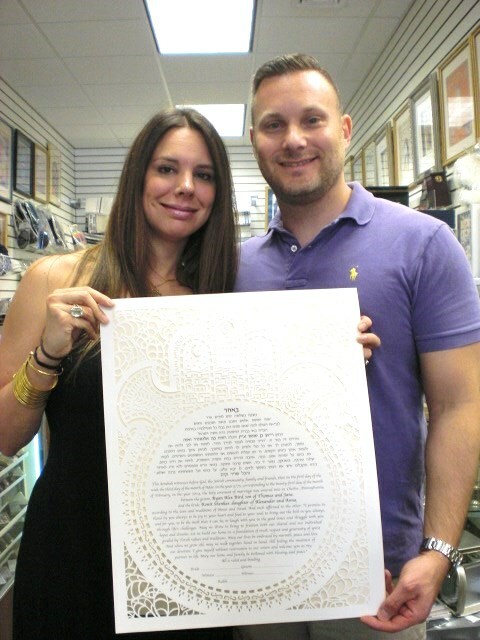 Andrea and Jason chose Mickie Caspi's Song of Love Papercut. Wedding: September 17, 2016. 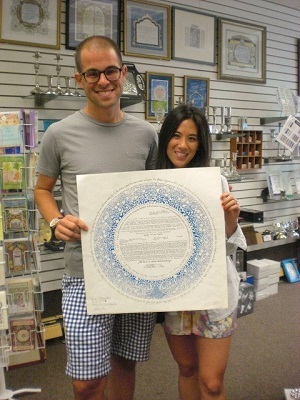 Rocio and Evan chose Mickie Caspi's Blue Scroll. Wedding: August 6, 2016. 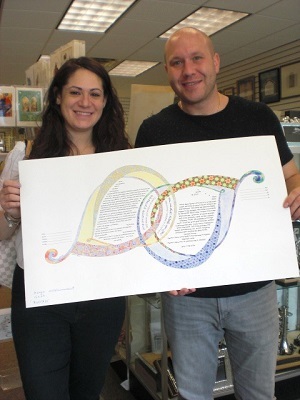 Raquel and Ryan chose Danny Azoulay's Dancing Waves. Wedding: July 10, 2016. 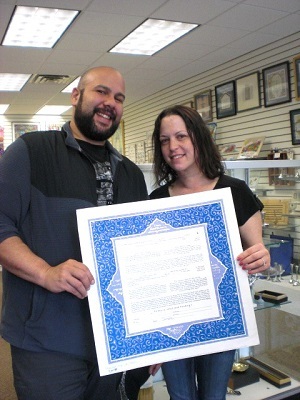 Dale and Jason chose Cindy Michael's Devotion 2. Wedding: June 25, 2016. 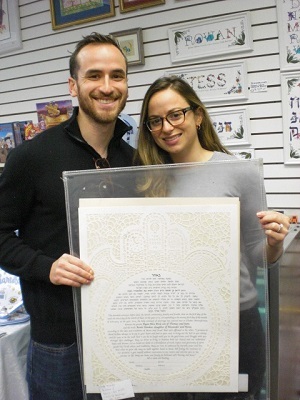 Amanda and Mory chose Nava Shoham's Chamsa 2. Wedding: April 30, 2016. 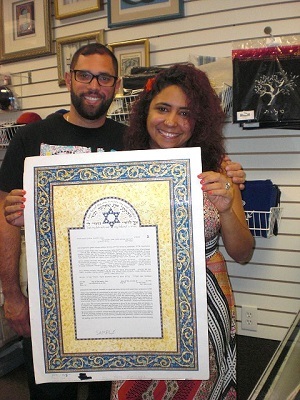 Megan and Charles chose Nava Shoham's Chamsa 2. Wedding: March 26, 2016. 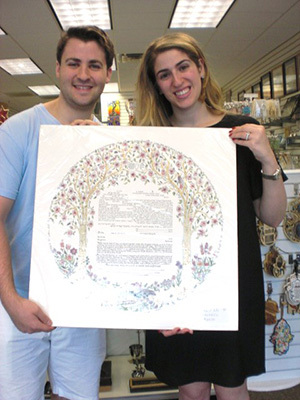 Lara and Adam chose Mickie Caspi's Tree of Life. Wedding: January 17, 2016. 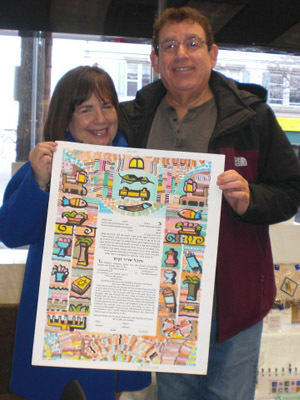 They chose Amy Fagin's Hand In Hand. Wedding: December 11, 2015. 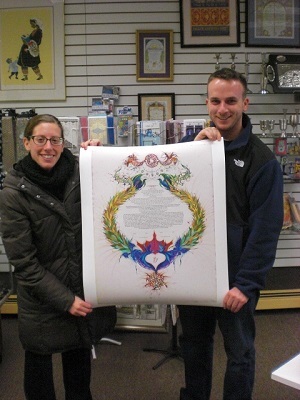 Jacqueline & Evan chose Amy Fagin's One Heart/Edition 1. Wedding: November 21, 2015. 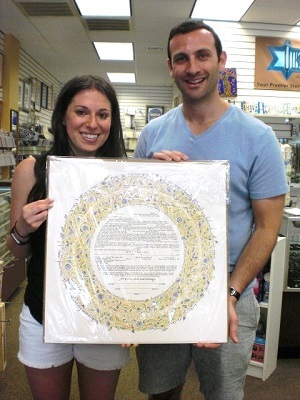 Rebecca and Lance chose Mickie Caspi's Persian Silk. Wedding: October 25, 2015. 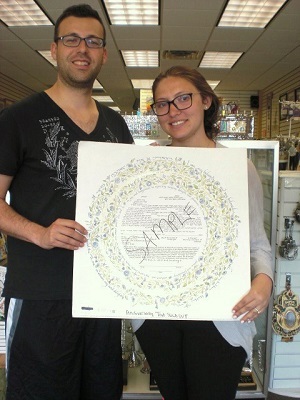 Lauren and Gregory chose Mickie Caspi's Seasons of Joy. Wedding: October 25, 2015. 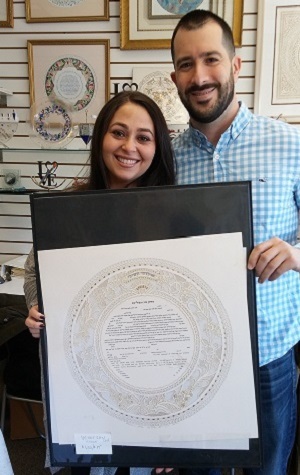 Heather and Angelo chose Nava Shoham's Chamsa 2. Wedding: October 24, 2015. 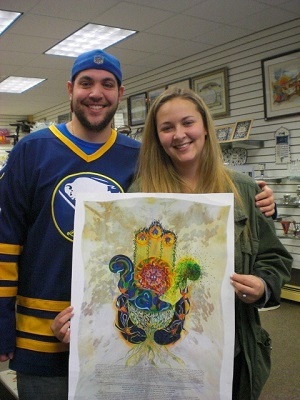 Jillian and Scott chose Mickie Caspi's Blue Silhouette. Wedding: October 12, 2015. 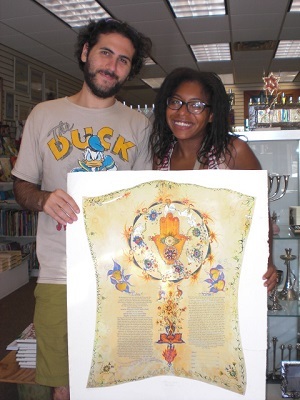 Fantasia and Joshua chose Nava Shoham's Chamsa 1. Wedding: October 11, 2015. 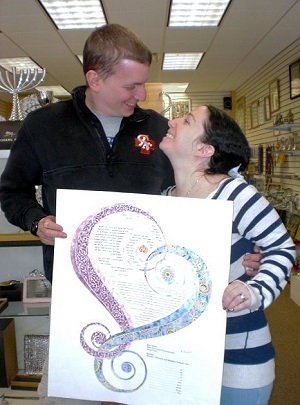 Cynthia and Ross chose Nishima Kaplan's After The Kiss. Wedding: October 10, 2015. 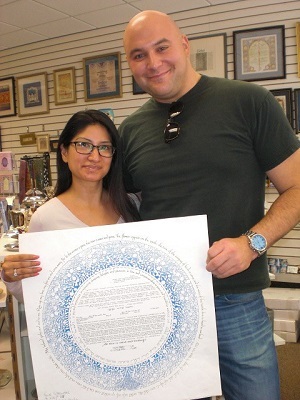 Michelle and Rodger chose Nishima Kaplan's Dancing Together at Midnight. Wedding: October 4, 2015. They chose Elliot Bassman's Seaside. Wedding: October 3, 2015. 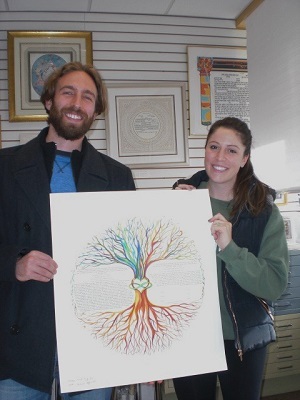 Ashley and Sam chose Betsy Teutsch's Tree of Life III with gold accents. Wedding: September 5, 2015. 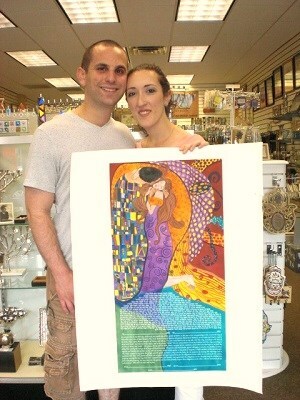 Lisa and Ira chose Nishima Kaplan's After the Kiss. Wedding: August 29, 2015. 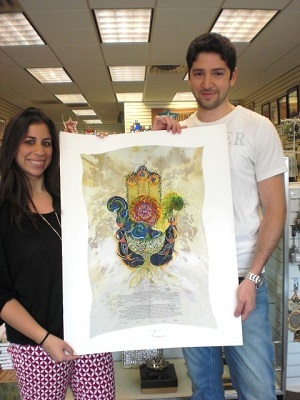 Ilyse and Joseph chose Mickie Caspi's Persian Silk. Wedding: July 19, 2015. 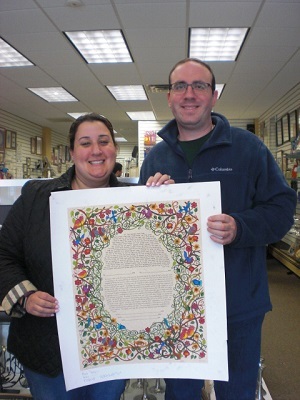 Kate and Matthew chose Mickie Caspi's Seasons of Joy. Wedding: August 2, 2015. 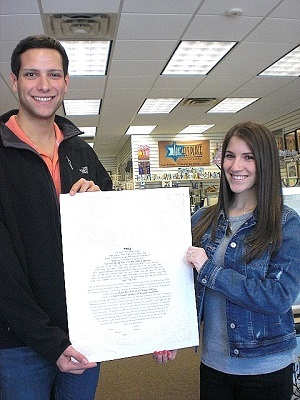 Corey and Evan chose Mickie Caspi's Song of Love. Wedding: July 26, 2015. 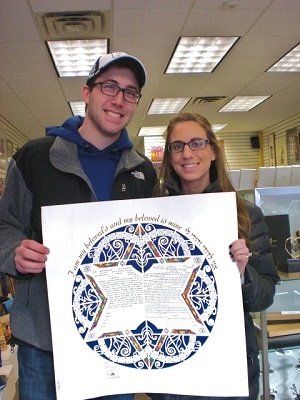 Lindsay and Jonathan chose Mickie Caspi's Mystic Jerusalem. Wedding: July 25, 2015. 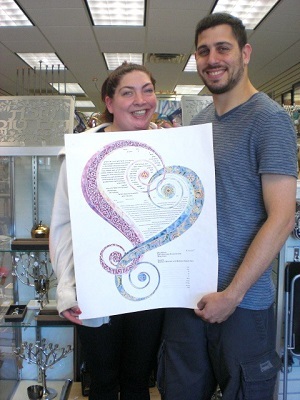 Jenna and Robert chose Amy Fagin's One Heart-Edition 1. Wedding: July 2, 2015. 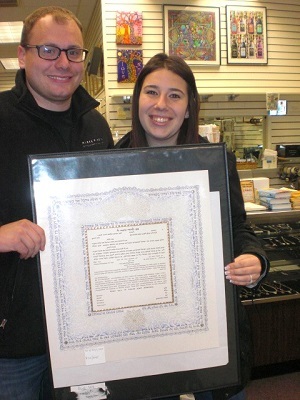 Rachel and Stephen chose Leslie Naveh's Forever Flowers. Wedding: May 16, 2015. 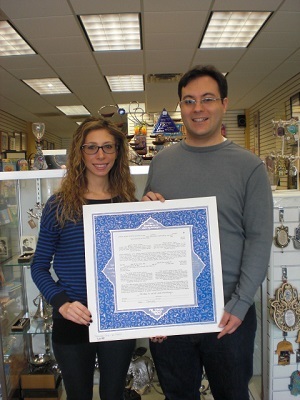 They chose Mickie Caspi's Persian Silk. Wedding: April 18, 2015. 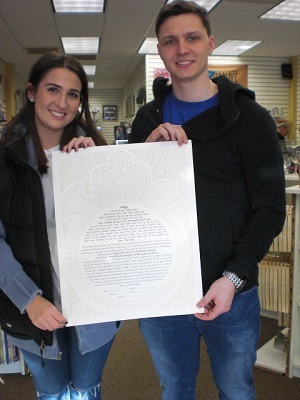 They chose Nava Shoham's Royal Cladoagh.